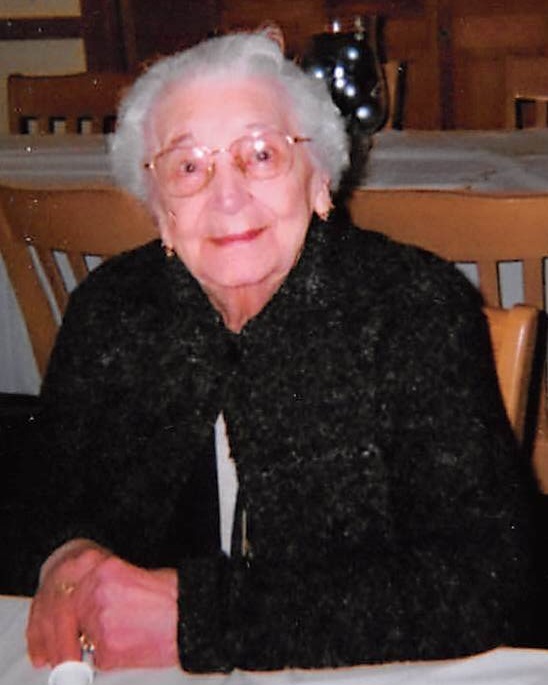 Gina (Ravazzola) Galvani, 111, a longtime resident of Framingham died on Sunday, January 27, 2019 at Bethany Health Care Center. Born in Castell Arquarto, Italy, she was the daughter of the late Carlo & Nobilina Ravazzola, and the beloved wife of the late John P. Galvani. Gina grew up on a farm in Italy and immigrated to the U.S. in 1930 with her husband and daughter and settled in the Italian neighborhood of Framingham known as Tripoli. Having endured the Great Depression, her work ethic was unmatched and many years worked as a seamstress at the apron factory in Framingham. She became a U.S. citizen in 1944. Gina was a member of St. Tarcisius Parish, She enjoyed an active social life, and loved trips to Italy and FL with family and friends. She was the oldest surviving member of the original group recruited for the Framingham Heart Study. Gina’s life consisted of good family, good friends, good fun, good food, and faith. She is survived by her grandchildren, John Mancini, Carlo Galvani, Joanne Thayer, John Galvani, Peter Galvani, Thomas Galvani, and Robert Galvani, 17 great grandchildren, and 8 great great grandchildren, and her daughter-in-law, Ann Galvani. Besides her husband John, she was predeceased by her daughter and son-in-law, Ave Maria & Joseph Mancini, her son and daughter-in-law, Carlo & Caroline Galvani, her grandson, Joseph Mancini, her great granddaughter, Kayla Galvani, and her brother Pietro Ravazzola. Family and friends will honor and remember Gina’s life by gathering for visiting hours in the McCarthy, McKinney & Lawler Funeral Home, 11 Lincoln St. Framingham, on Wednesday, January 30th from 4 – 8 P.M. Her Funeral Mass will be celebrated on Thursday morning in the Holy Spirit Chapel, Bethany Health Care Center, 97 Bethany Rd. Framingham, at 10:15 A.M. Interment will follow in St. Tarcisius Cemetery. In lieu of flowers, remembrances may be made in Gina’s name to: Bethany Health Care Center, www.bethanyhealthcare.org.